OAuth is a standard for authenticating users. There are many third-party OAuth authentication service providers are available. In this post, we learn to create a web application which allows users to Login with there Twitter credentials. I am using Ktor to develop this application. This post assumes that users are having basic knowledge of OAuth and Ktor. Below is the application preview of what we are going to develop in this port. Update hosts file by adding a new entry like shown below. You need root/admin access to edit this file. In Linux based operating systems this file exists at /etc/hosts and in Windows it exists at %SystemRoot%\System32\drivers\etc\hosts. Now having a new entry in the host file, we can access local machine using me.mydomain.com. This Web application which we are developing in this post allows users to log in with there Twitter credentials. However, before that, we need to register our application with Twitter, and the below steps will help us in creating a new application with Twitter. Sign in to twitter developer account https://developer.twitter.com. Create a new account if not exists. Create a new app by clicking on Create an app button. Provide new app details like shown in below. Enter ‘Website URL’ and check ‘Enable Sign in with Twitter’ and then enter ‘Callback URLs.’ as shown in below image. When a user logs in successfully, then Twitter redirects to the given callback URL. Provide your application details in the final text area and then click on ‘Create.’ This action will create a new application. Within the application details go to ‘Keys and Tokens’ tab. Here you see the generated Consumer API Keys. We are going to use these values in our application. Execute below commands to create an empty gradle Kotlin project. Once the project is created then import it into your favorite editor. This command will create a new project with standard folder structure. Login: Page shows a Twitter link. When the first time user accesses this page, then the user needs to click this link, then the application redirects to Twitter. Main: Once user logs-in successfully then they land on this page. This page has two links; one for visit Setting page and other is to Logout. Settings: This page contains a link back to the Main page and a link to log out. Error: This page shows errors if any. We created an embedded Netty server which runs on 8080. CallLogging: Logs all HTTP requests. This feature is useful for debugging. Sessions: We have multiple pages in our application. A user can navigate between Main and Settings pages, so the session helps in tracking the user state. Authentication: The Main motive for this post is to authenticate users, so we need this feature. <1> Session: In a web application we can maintain sessions in various ways, but in this application, we are using cookies. We can store cookies either at the client side or server side. Client-side is vulnerable for attacks so let’s store them at the server side in memory. Learn more about configuring sessions in this link. client: We are using Apache HTTPClient. Our application connects to Twitter while authenticating users, so it needs an HTTP client for communication. providerLookup: Pass OAuthServerSettings instance. This instance contains some vital information related to the authentication service. These settings differ based on the service provider. In the code, I have given dummy text in consumerKey and consumerSecret, but you need to update these with your application-specific values from Twitter. urlProvider: Page to where the application redirects after authentication. We need to configure multiple routes to navigate between the pages. /: Display login page with a link to Twitter. A user needs to log-in before accessing other pages. /settings: This page contains links to main and log-out. /login/twitter: Redirect to Twitter for authentication, and this route is within ‘authenticate’ call. call.authentication.principal makes HTTP call to the authentication service. The response of this call is saved in the principal which contains the user details and token. If the principal is found then redirects to /main page else to log-in page. We completed configuring all routes, and there are some utility functions which I am using but not explained here. They are self-explanatory, please refer them in the project here. 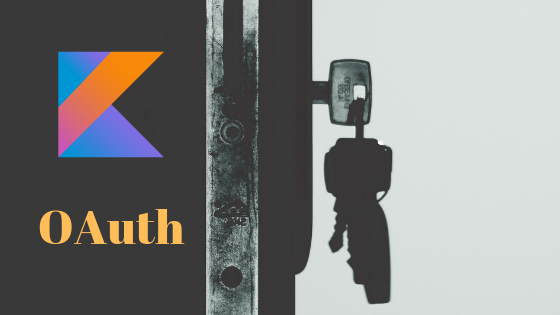 We developed a simple kotlin project with Ktor and Authentication features to enable user to login with there Twitter credentials.